Hear an extract from the audiobook, read by Michael Holland. When a popular Troubleshooter gets married, what was supposed to be a low-profile ceremony for family and friends snowballs into a thrill ride featuring a nosy reporter, a dashing personal assistant, and a stalker determined to claim the object of his obsession. 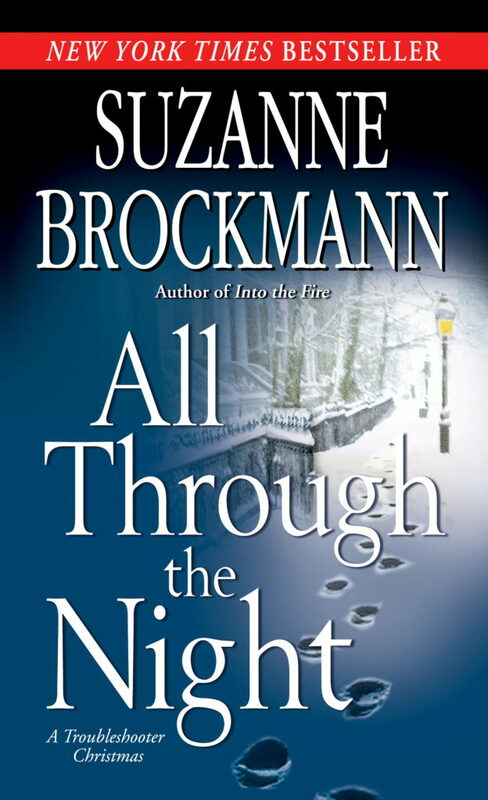 In All Through the Night, Brockmann delivers another passionate and electrifying classic, this time featuring an unforgettable Christmas wedding, and an insatiable, unexpected romance. It’s Christmastime in Boston, and this year the silver bells will be wedding bells as FBI agent Jules Cassidy ties the knot with the man of his dreams, Hollywood heartthrob Robin Chadwick. The pair plan a quiet, intimate ceremony, to be witnessed by family and close friends from the FBI, SEAL Team Sixteen, and Troubleshooters, Incorporated, including Sam Starrett and Alyssa Locke. But the holiday season brings more to the happy couple than they expect. A waterfall coming through their kitchen ceiling, a bat colony in the attic, old family tensions… even an international incident can’t dampen their spirits. But add to that a parade of unexpected guests, including a reporter looking for a scoop, an ex-lover hell-bent on causing trouble, and a dangerous stalker, and suddenly the wedding is poised to unravel in chaos. But nothing will stop Jules and Robin from getting their happy ending, because along with a guest list featuring the most elite counterterrorism force in the world, they have their own secret weapon – true love. All author proceeds, including royalties and all subrights including audiobook, from All Through the Night go to MassEquality, the GLBT rights organization that helped win equal marriage rights in Massachusetts. Read more about it here. The original title for this book was Joyful Noise, but the publisher wanted something different. They toyed with the title Tidings of Joy, but with the Christmasy cover art, it gave the book an “inspirational romance” feel. Eventually Brockmann turned to Cole Porter, whose lyrics often contain beautiful subtext about life as a closeted gay man. As a teenager, Brockmann had appeared in a (Guilford, CT) high school production of Anything Goes, and during the title search she kept returning to the haunting melody and words of All Through the Night. In All Through the Night, Jules and Robin live in Boston’s South End in a pre-Victorian house that has a very similar layout to Brockmann’s own former home in Waltham, Massachsetts. ALL THROUGH THE NIGHT is available as an unabridged audio book from Brilliance Audio — read by Michael Holland! Hear an excerpt above!